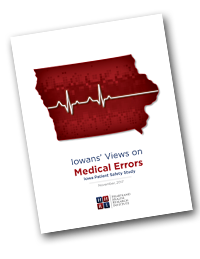 ‘Iowans’ Views on Medical Errors – Iowa Patient Safety Study©’ was published in December 2017. The Iowa Patient Safety Study© serves as the next step of research undertaken by HHRI to determine a new level of precision on whether the estimates found in Silently Harmed are laudable. Because medical error reporting by health providers (and patients) are scant and largely unavailable, this study gives a ‘voice’ to real Iowans to determine just how extensive medical errors are within Iowa. The Iowa Patient Safety Study© consists of approximately 115 questions asked of randomly-selected Iowans about their views and experiences while interacting with Iowa healthcare providers. Fundamental questions address whether Iowans, in the past five years, have personally been involved in a situation where a preventable medical error was made in their own medical care or in the care of someone close to them in which the respondent was very familiar with the care received.